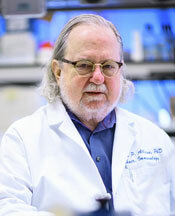 Jim Allison has spent a distinguished career studying the regulation of T cell responses and pioneering new strategies for cancer immunotherapy. Among his most notable discoveries are the determination of the T cell receptor structure and that CD28 is the major costimulatory molecule that allows full activation of naïve T cells and prevents anergy in T cell clones. His lab resolved a major controversy by demonstrating that CTLA-4 inhibits T-cell activation by opposing CD28-mediated costimulation and that blockade of CTLA-4 could enhance T cell responses, leading to tumor rejection in animal models. He proposed that blockade of immune checkpoints such as CTLA-4 might be a powerful strategy for therapy of many cancer types, and conducted preclinical experiments showing its potential. These seminal findings established the field of immune checkpoint blockade therapy for cancer. Work in his lab led to the development of ipilimumab, an antibody to human CTLA-4 and the first immune checkpoint blockade therapy approved by the FDA. Since that time ipilimumab has been approved as part of the therapeutic regimen for metastatic melanoma, renal cell carcinoma, and lung cancer. His current work seeks to improve immune checkpoint blockade therapies currently used by our clinicians and identify new targets to unleash the immune system in order to eradicate cancer. Among many honors, he is a member of the National Academies of Sciences and Medicine. His more recent awards include the Breakthrough Prize in Life Sciences in 2014, Lasker-Debakey Clinical Medical Research award in 2015, the Balzan Prize in 2017, and the Kovalenko Medal from the National Academy of Sciences, the King Faisal Prize in Medicine, the BBVA Foundations of Knowledge Prize, and the Dr. Paul Janssen Award so far in 2018. Dr. Flaherty is director, since 2012, of the Henri and Belinda Termeer Center for Targeted Therapy and, since 2014, director of Clinical Research at the Massachusetts General Hospital Cancer Center, and Professor of Medicine at Harvard Medical School. 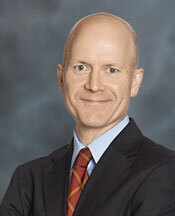 As described in the more than 250 peer reviewed primary research reports he has authored or co-authored, Dr. Flaherty and colleagues made several seminal observations recently that have defined the treatment of melanoma when they established the efficacy of BRAF, MEK and combined BRAF/MEK inhibition in patients with metastatic melanoma in a series of New England Journal of Medicine articles for which Dr. Flaherty was the first author. Dr. Flaherty also has been a leader in assessing and identifying mechanisms of de novo and acquired resistance to BRAF inhibitor therapy and clinically evaluating next generation inhibitors, work that has had implications for resistance to targeted therapy regimens used to treat other malignant diseases. Dr. Flaherty has received extensive NCI funding support with K12, K23, SPORE, RO1, U54 and PO1 grants. 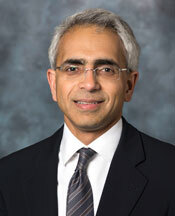 He serves as editor-in-chief of Clinical Cancer Research. He is the principal investigator of the NCI MATCH trial, the first NCI-sponsored trial assigning patients to targeted therapy independent of tumor type on the basis of DNA sequencing detection of oncogenes. He has made major commitments to ECOG as chair of the Developmental Therapeutics Committee and in 2013 was appointed as ECOG Deputy Chair for Biomarker Science. Ravi Thadhani MD, MPH is the Vice Dean for Research and Graduate Research Education at Cedars-Sinai Medical Center in Los Angeles, California. Formerly he was Professor of Medicine at Harvard Medical School and Chief of Nephrology at Massachusetts General Hospital, and Executive Director of the Clinical Trials Office at Partners Healthcare in Boston. Dr. Thadhani has two major areas of interest: medical complications of pregnancy (preeclampsia and gestational diabetes) and vitamin D metabolism. He is also an expert in the science and management of cachexia in medical conditions such as chronic kidney disease (CKD). His goals are to translate biological discoveries into novel diagnostics and therapies for humans. In the area of preeclampsia, his collaborations with basic scientists have led to novel diagnostic tests now available in Europe and are being tested in the U.S., and of late, first-in-human clinical trials to prolong pregnancy in women with severe preterm preeclampsia. In the area of vitamin D metabolism, he has performed observational studies, collaborated with basic scientists in animal experimental studies, and translated these findings to multinational randomized trials to test several hypotheses in humans. More recently, he and collaborators put forward another paradigm-changing concept related to bioavailable vitamin D, potentially changing our view of who truly is vitamin D deficient. Dr. Thadhani has mentored several fellows and junior faculty members, all of who have had a strong track record of publications and grant support, and many of who are on faculty at leading institutions around the country. Dr. Thadhani has served as a reviewer for and has published in several journals including New England Journal of Medicine, Journal of American Medical Association, Lancet, Proc National Academy of Science, Circulation, Journal of America Society of Nephrology, and Kidney International. He is an inducted member into the American Society of Clinical Investigation, the American Epidemiology Society and the Association of American Physicians. He is the recipient of numerous awards and honors including the Alumni Award of Merit from the Harvard School of Public Health and the Harold Amos Faculty Diversity Award, Harvard Medical School. 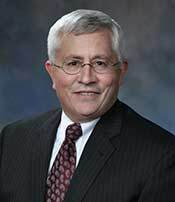 Michael Lewis, Ph.D. is a Professor in the Departments of Molecular and Cellular Biology and Radiology, and a member of the Lester and Sue Smith Breast Center at Baylor College of Medicine (BCM). He studied biology at the College of William and Mary and received his doctoral degree from the University of California, Santa Cruz (UCSC). After postdoctoral training at UCSC and the University of Colorado Health Sciences Center UCHSC) in Denver, Dr. Lewis then joined the faculty at UCHSC in the Department of Physiology and Biophysics. Shortly thereafter, he became a faculty member at BCM. Dr. Lewis has expertise in breast development and breast cancer, with a focus on the identification and regulation of tumor-initiating cells (a.k.a. “cancer stem cells”) and the goal of identifying new vulnerabilities in these cells that can be targeted therapeutically. As part of this work, he developed one of the largest human breast cancer patient-derived xenograft (PDX) renewable tissue resources available, a resource used worldwide for evaluation of experimental therapeutics in the area of breast oncology. Dr. Lewis co-founded StemMed, Ltd., the parent company of Tvardi Therapeutics, Inc., and continues as its President and Chief Executive Officer.